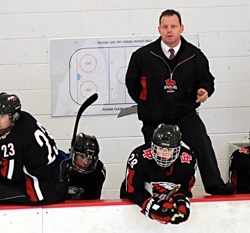 Eden Prairie coach Lee Smith has seen plenty of good hockey in recent years (Photo by Tim Kolehmainen). When the season began, two teams expected to be among the contenders for the No. 1 spot in the Class AA rankings were Eden Prairie and Hill-Murray. But each tumbled from the head of the class by suffering two losses before the holidays, an unusual occurence for the powerhouses. Let's just call it a hiccup. Because both stormed back with impressive performances in their respective holiday tournaments last week, Eden Prairie (8-2-0) claiming the Hockey Holiday Classic in St. Louis Park and Hill-Murray (7-2-0) earning the Schwan Cup Gold Division title at the Xcel Energy Center. Those showings vaulted the two back atop the rankings, setting up a No. 1 versus No. 5 (based on the Hockey Hub's latest state rankings) showdown for the Breakdown's Game of the Week. Eden Prairie came into the holidays on the heels of a two-game losing streak, falling 3-2 to Edina in overtime on Dec. 18 and 4-2 to Eagan on Dec. 22. The Eagles showed no signs of those struggles at St. Louis Park, though, crusing to big victories over Benilde-St. Margaret's (8-5), Maple Grove (6-0) and Moorhead (4-0). Take out a third-period letdown against the Red Knights in a game the Eagles led 7-2, and they outscored the three opponents 16-2 in the other eight periods. As was expected when he announced his return to Eden Prairie, Mr. Hockey favorite Kyle Rau (15-11-26) has been leading the Eagles' offense. But he was teamed up with new linemates in St. Louis Park to great effect, as twin brothers David Rath (14-11-25) and Mark Rath (3-9-12) added some much-needed punch. The Eagles aren't a one-line team, though, as speedy Luc Gerdes (9-10-19) and company are helping the team score 5.9 goals per game. Defensively, Dan Molenaar (2-14-16) helps out both in his own zone and as a catalyst on offense, while Curt Rau is a steady and conscientious defender. They lead a strong defensive corps in front of regular goaltender Andrew Ford (6-2-0, 2.48 GAA, .897 save percentage), who is in his third year as a starter and backstopped the Eagles' state championship in 2009. Hill-Murray's JD Cotroneo zeros in on a Breck forward (Photo by Tim Kolehmainen). 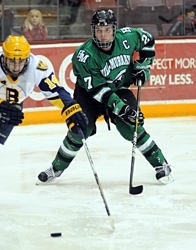 Meanwhile, Hill-Murray (7-2-1) dropped its two games early. The Pioneers stumbled out of the gates, losing two of their first three games to Burnsville (6-4 on Nov. 27) and Benilde-St. Margaret's (3-1 on Dec. 4). They haven't lost since, ripping off a 6-0-1 stretch in which they've outscored opponents 36-10. In the Gold Division of the Schwan Cup, the Pioneers shocked most observers by putting an 8-0 running-time thumping on two-time Class A champion Breck in the quarterfinals. The road to a title got tougher after that, but Hill-Murray responded with a shootout victory over Edina (a game that counted as a 3-3 tie) in the semifinals and a come-from-behind victory over Minnetonka in the finals, 5-3. The Pioneers actually trailed 3-1 midway through the second period, but rallied behind goals from Ben Bahe, Bobby Bruski and two from Zach LaValle to get the win. Bahe (11-8-19) is one of the leaders on the veteran Pioneers and paces the team in both points and goals. But Hill-Murray is a balanced team. Six players have at least 10 points, including Kevin Becker (4-9-13), Ryan Holler (3-8-11), LaValle (8-3-11), Loren French (2-8-10) and Jake Guentzel (4-6-10) and another nine have multiple points. The Pioneers are also strong and deep on the blue line, with senior captain J.D. Cotroneo (2-4-6) the anchor of the unit. Like Eden Prairie, Hill-Murray also has a three-year starter in goal in Tim Shaughnessy (6-2-1, 1.86 GAA, .903 save percentage), who has been through the wars many times. Expect a festive atmosphere around this one, which will be held in the brand spanking new Amsoil Arena in Duluth. Organizers are hoping for upwards of 6,000 people to pile into the new building to see the city's only two public schools go head-to-head. It won't just be a hockey game, as other events include school pie-eating contests, tricycle relays and a battle of the bands. Also expect to see some good hockey. High-scoring Duluth East (8-2-0) is coming off a consolation title in the Schwan Cup Gold Division, while Central (6-6-0) finished second in its own Heritage Holiday Classic. Talk about walking into a lion's den. Mahtomedi (3-7-1) has the uneviable task of visiting what should be a very angry St. Thomas Academy (4-3-0) Saturday afternoon. The Zephyrs have beaten the favored Cadets in each of the last two Section 4A tournaments, stopping St. Thomas Academy shy of its bid to reach state. Mahtomedi is a young team that struggled in the early going after losing Charlie Adams, Brandon Zurn, Brad Wohlers and Ben Marshall, but has been impressive in defeat, particularly a 4-3 loss to powerful Grand Rapids in its most recent game. The Cadets tested themselves with a very tough early season schedule, including a date in the Schwan Cup Gold Division. What appeared at season's start to be a one-horse race in Section 2AA (Edina) became much more interesting over the holidays, particularly with the show put on by Holy Angels in the Schwan Cup Silver Division. The Stars (4-2-0) won three straight games against good foes (Burnsville, Blake and Cretin-Derham Hall) with big scoring outbursts of 6, 7 and 8 goals. Joseph LaBate (9-4-13) and Cullen Hurley (5-8-13) are veteran leaders on a young team. Meanwhile, Edina (6-2-2) continued to play a series of tight games, tying twice (Hill-Murray and Blaine) and winning late in the third period (Duluth East) in the Schwan Cup Gold. The Hornets have played eight games decided by one goal or less. It was a bit of out-of-sight, out-of-mind for Apple Valley. The Eagles (8-2-0) were one of the few top teams that didn't play in a holiday tournament last week, instead beating East Ridge in a regular game on Dec. 30 to push their winning streak to five games. Meanwhile, Eagan (6-2-1) enters after dominating the South St. Paul Premier Tournament over the holidays. The Wildcats outscored three opponents (North St. Paul, Woodbury and South St. Paul) by a 16-2 margin, continuing a great run that began with a 4-2 victory over No. 1-ranked Eden Prairie. Eagan is very stingy defensively in front of goaltender Tommy Bodecker, only alloing 1.78 goals per game. This is a big game for both South Suburban Conference and Section 3AA bragging rights. The beat goes on in Hermantown under coach Bruce Plante. Despite losing 14 key seniors, the Hawks (9-0-1) remained unbeaten through the first month of the season. Hermantown isn't blowing many teams out, but have found a way to win tough games, including going 2-0-1 in Thief River Falls over the holidays. Veteran forwards Garrett Skrbich and Jared Thomas are carrying a big offensive load, combining for 24 goals. Duluth Marshall (7-4-1) fell to Superior (WI) in the championship game of its Hilltopper Holiday Classic. It ended a four-game winning streak for the Hilltoppers, who are led in scoring by Judd Peterson with 12 goals. The early lead in the always cluttered Suburban East Conference is up for grabs in this game. White Bear Lake (6-4-0) has won its first four conference games, while Stillwater (5-3-1) has three wins and a tie in its first five. The Bears had a tough go in the Schwan Cup Gold Division over the holidays, losing the first two before recovering to edge Breck, 2-1. Brandon Wahlin and Mac Jansen have combined for 23 goals for the Bears. Stillwater also lost two of three in the Schwan Cup Silver Division, scoring just a single goal in each loss. The Ponies have a great -- albeit unheralded -- goaltending tandem in Gordy Defiel and Blake Cates, each of whom has a save percentage well over 90 percent. This game might not get a lot of notice among the Twin Cities hockey fans, but it's a big game in both communities -- and in the Section 3A race. Litchfield/Dassel-Cokato (6-0-1) is one of the few remaining unbeaten teams in the state and looks to be a contender in the section, which has been in the grip of New Ulm (7-1-2) for the past year and a half. The Dragons have been among the most stingy teams in the state, allowing just 1.14 goals per game. Netminders Ryan Koivisto and Derek Sherman each have a save percentage of at least 93 percent. The Eagles made a statement over the holidays by winning the Rochester Kiwanis Tournament over Wisconsin's No. 1 team, East Claire Memorial. Can anyone stop the runaway train that appears to be Rochester Lourdes in Section 1A? Here's a great chance for Albert Lea and legendary coach Roy Nystrom to pull an upset and shake up the section seedings. The Tigers (8-2-0) have won four of five one-goal games this winter, including tight ones over Section 1A foes Northfield and New Prague. Eric Carlson (18-10-28) is one of the top goal-scorers in the state. Lourdes (11-1-0) finally suffered its first loss of the season, but it was to Eau Claire Memorial (WI), the top-ranked team in Wisconsin. The Eagles have already beaten New Prague, Red Wing and Northfield. How will Wayzata (10-2-0) respond to its first two losses of the season -- back-to-back against Moorhead and Maple Grove in the St. Louis Park Holiday Hockey Classic? That's the big question in this game, which pits one of the state's best lines in Tony Cameranesi (10-21-31), Mario Lucia (14-13-27) and Tyler Klein (8-12-20) against one of the state's best goaltenders in Charlie Lindgren of Lakeville North. Lindgren and the Panthers (5-3-1) have already upset Eagan and tied Grand Rapids this past week, with the junior netminder making 99 saves on 102 shots in those games. His goals against (3.50) isn't an indicator of how tough he is to solve.